So, at Essen 2016, one of the games that I missed out on was Fold-it! This was a game that used a silk like handkerchief that could be folded up in a speed game to see who could get the right arrangement of icons to show up on the folded cloth. There were not many copies available at the show, and by the time that I heard about it, they were all snarfed up by smarter Essen-goers that yours truly. Fast-forward to this year. I was super excited to hear that Fold It had been picked up by Goliath, and I thought that I’d surely be able to get a copy. 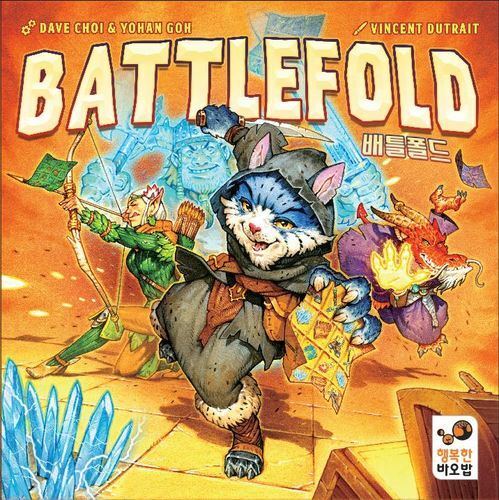 I was even more excited to learn at my first meeting of the show that there was a new game out this year which took the basic conceit (the folding handkerchief) and improved upon it – a game called Battlefold. In this game, players take on the role of one of 4 warriors, each with slightly different abilities. They are fighting it out on a 5×5 arena. 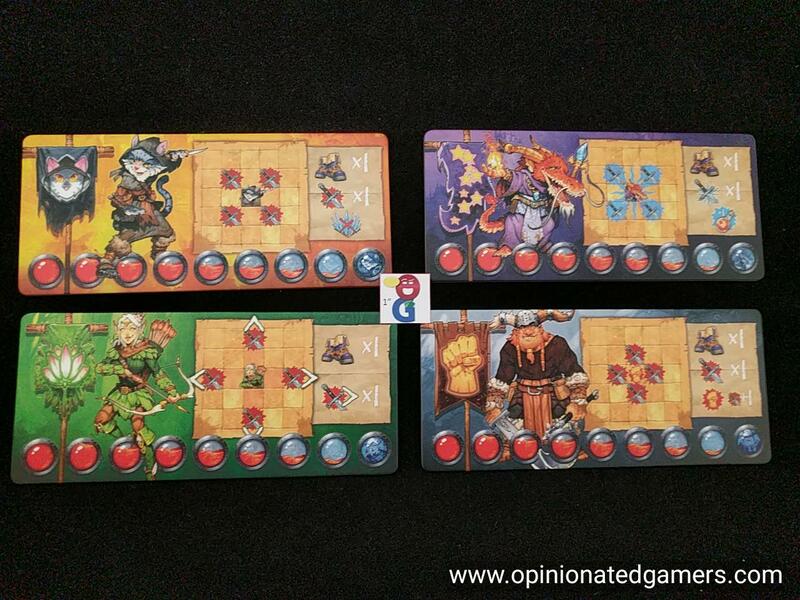 Each player has their own player board which shows their abilities as well as a matching colored handkerchief. 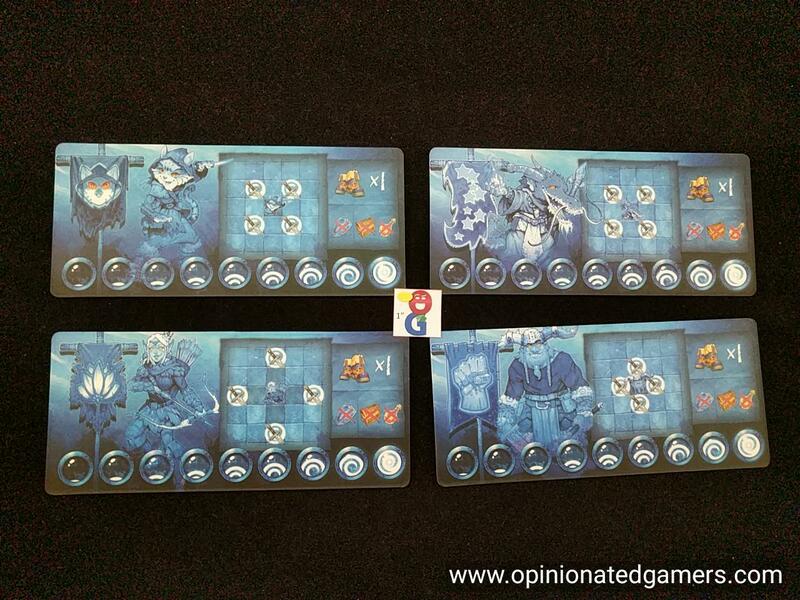 There is also a deck of battle cards, each of which shows some combination of 2-4 different icons on them. The game is played over a number of rounds until a single victor is crowned. To start each round, the top card from the battle card deck is flipped over. 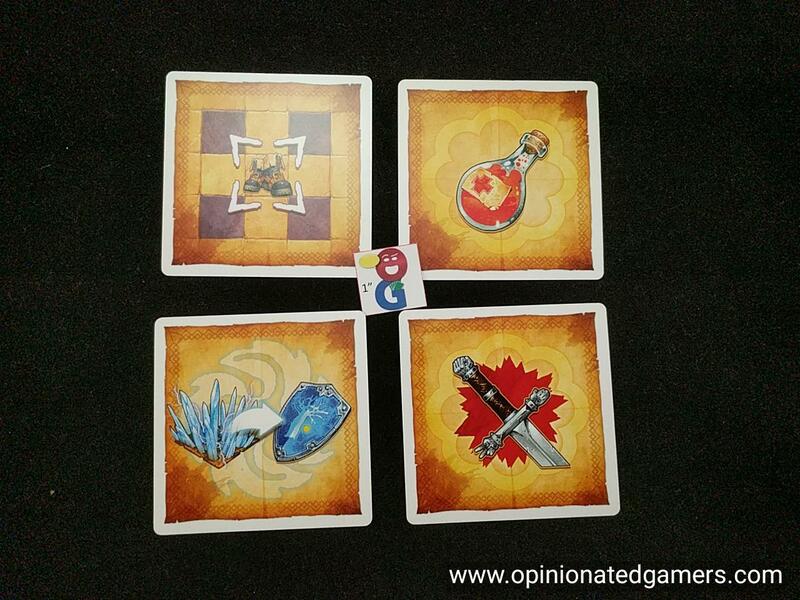 All players then simultaneously try to fold their handkerchief to show only the icons shown on the card. If a question mark is shown, then any icon can be seen for that “?”. Each particular cloth has the same pattern on both sides BUT each of the four handkerchiefs are different from each other. As soon as you have finished folding your cloth, you take the lowest numbered action token from the side of the board. The numbers on the tokens taken will correspond to the player order in the next phase. 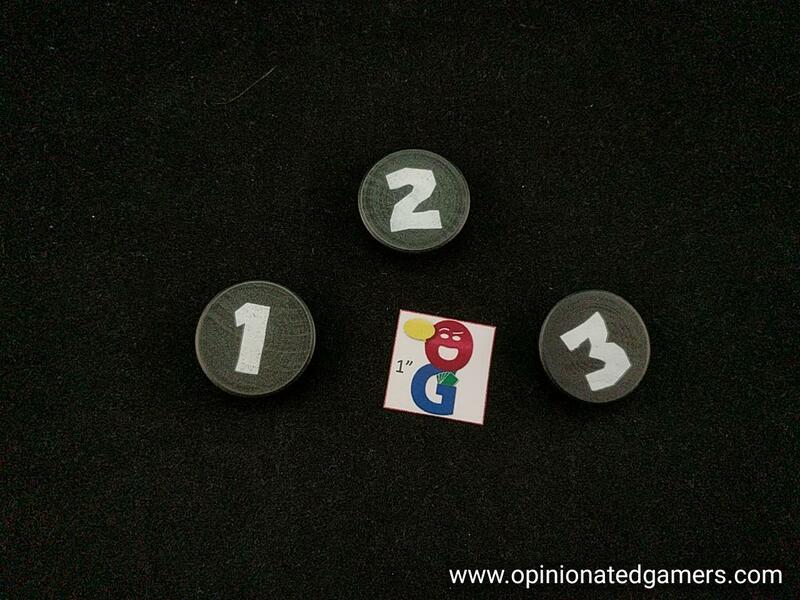 In the battle phase, the player with the “1” action token goes first. First, he must confirm that the icons on his handkerchief match the card. If not, his turn is over. If so, then he gets to take actions based on what is shown on their cloth. He can take the actions in any order that they choose. Each player also has a move and attack action as their basic actions – these are seen on their player board. Attack – each player has a specific attack range as shown on their player board. If you can reach an opponent legally, you can attack them. The number of swords equals your attack strength. You only make one attack per turn, the number of icons changes the strength of the attack, not the number of attacks. Item – For each treasure chest seen, you draw an item card from the item deck. Keep this secret, and you can play them at any point on one of your turns. All item cards are one-use only. After used, discard it. Shield – For each shield see, take a blue Shield token. These can be discarded when you are attacked to reduce the damage by 1 point per token. If the supply is empty, you can take a Shield token from any opponent. Trap – Decrease your health by 1 point. You cannot use a shield token to prevent this. Once you finish your actions, return your numbered token to the table and then the next player in order takes their turn. Note that there will always be one token less than the number of players. The player who finishes folding last will not get a token. 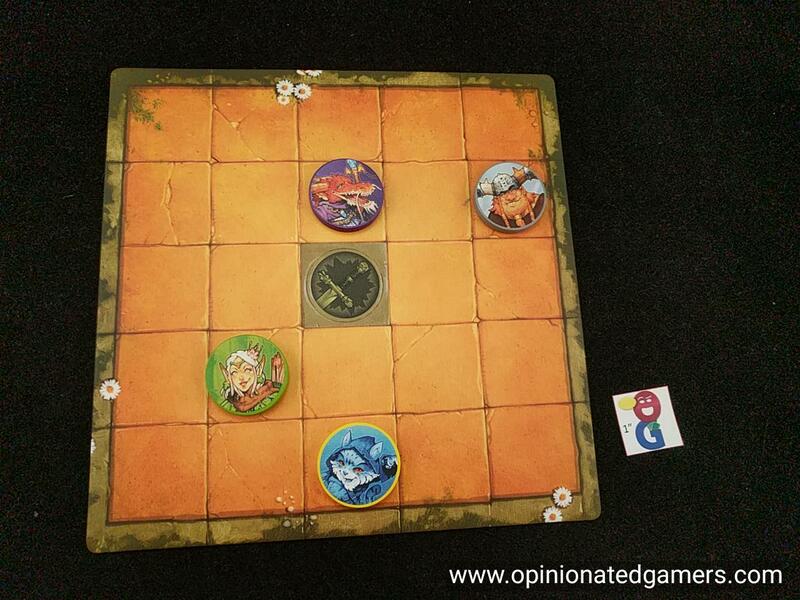 This player must go last in the battle phase AND MAY ONLY use the icons on their player board. They do not get any icons from their folded cloth. Each player starts the game at the start of their health track (8 spaces). When you run out of health points, you are not eliminated from the game! Instead, you transform into a ghost. You then flip over your player board to the ghost side. Ghosts can not use items, shields or health potions. The ghost now wants to try to restore its soul. There is a new 8 step track to mark this. The ghost continues to have turns, but now, the goal is to attack other players – if they are successful, they are able to gain as many soul points as they were able to damage. However, the attacked player does not lose any health. Game end – The game usually ends when all players but one are turned into ghosts. When this happens, the only “living” player remaining is the winner. However, it is still possible for a ghost to win. If a ghost is able to fully restore its soul (by damaging other players enough to get to the end of the ghost scoring track, then the ghost wins immediately. So, sometimes things just work out in the end. Though I missed out on Fold-It last year, I think I ended up with a game better suited for me. As much as I love the idea of the folding cloth, the game in Fold-it was really just a speed game; and as most of you probably know, I have huge issues with pure speed games. 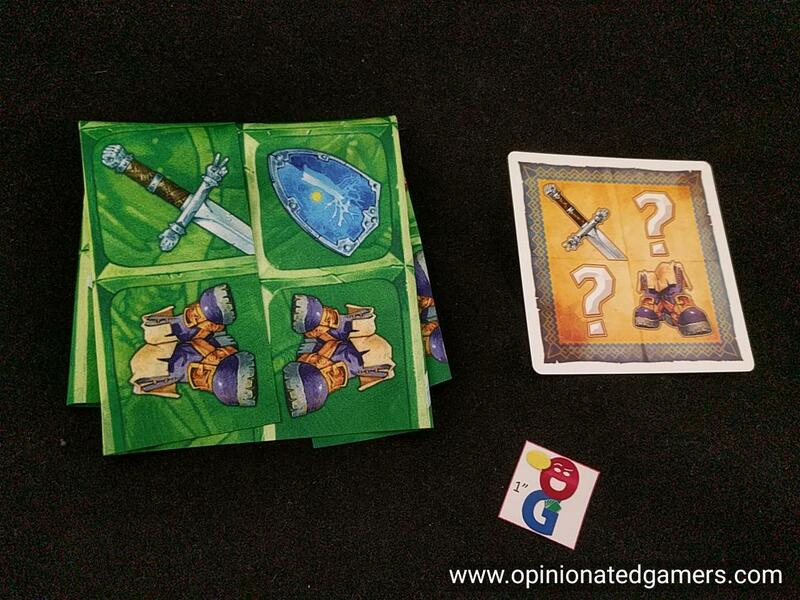 Battlefold keeps the great idea of the folding cloth, but now incorporates it into a decent fighting dungeon game. Speed is still somewhat important – the penalty for being last in the folding part can be tough – when you only get to take the actions on your card, you end up with a severely limited turn. However, it doesn’t completely rule you out of the game, and I’ve seen games where a player ended up being the slowest to fold most of the time, but this actually ended up giving him a bit of a chance to win because he was definitely the fastest to becoming a ghost and therefore had the most time to restore his soul. The actions are straightforward, so the game is easy enough to teach. Pretty much, anyone can get started in under ten minutes. However, there is a pretty good learning curve here. It takes a bit of skill and practice to learn how to fold the cloth the way you want and to do so as quickly as possible. Many of the battle cards have question marks on them, and then, there is a further bit of skill trying to get the actions you want for the question marks seen on the card (and to avoid things like traps). Each turn doesn’t last very long. The folding is usually over within 15 to 20 seconds – so you really have to be fast in that part. The battle phase can take a bit longer, as each player often has to take a minute to figure out all of his action options for the turn and then figure out what is the best order to do them in. Given the small size of the arena, the characters are really never more than a few spaces away from each other, so fighting happens almost every turn. The game ends up moving quickly, and while most games end with one single living player as the winner, I like the fact that the ghost ability helps keep players in the game and gives them a chance, albeit slim, to still win. Each character has slightly different base abilities, and you do have to adapt your strategy somewhat to each – so that should help with the replayability; as long as you keep changing colors, you’ll always have a slightly different outlook on the game. Also, though we haven’t tried it yet, there is also a team (2v2) variant in the rules which would also increase replayability. We haven’t felt the need to even try that yet as we are enjoying the cut-throat 3p and 4p games. Jeff Allers: I, too, was intrigued by the folding mechanic but not very enthusiastic about a pure speed game. 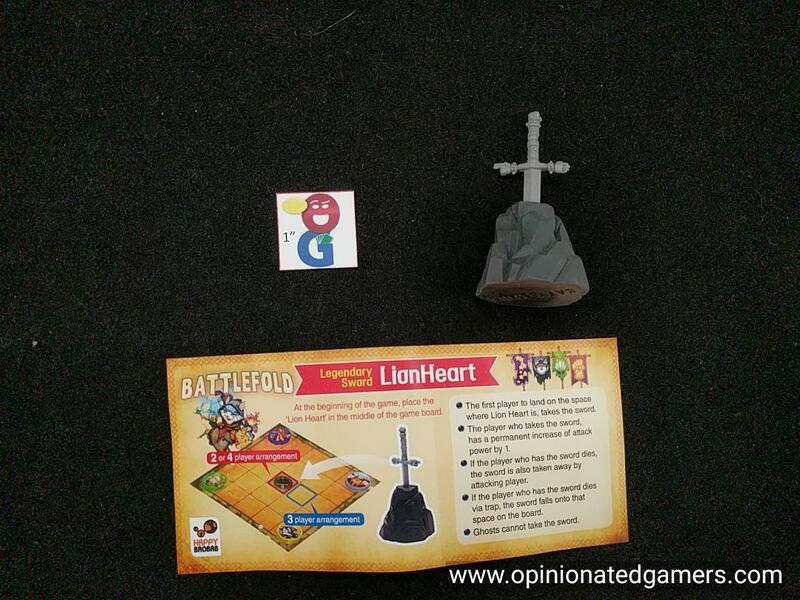 I picked up Battlefold in Essen and have enjoyed it as a light battle game. One of the most clever parts of the game is not even the folding mechanism, but rather how it solves the usual player elimination that exists in most battle games. Getting killed only changes your winning conditions, and the threat of a victory by a ghost player puts pressure on the living warriors to end the conflict that much faster, which is a great timing mechanism and could move the end of the game towards a climactic finish. That said, after repeated plays, I don’t think the ghost mechanic was developed enough. While the living players can always attack, even if they do not fold fast enough, the ghost loses his automatic attack and can only attack with sword symbols on his cloth. Sometimes all the symbols are prescribed from the battlecard and none of these are an attack, which means the ghost player has nothing to “fold” for. Furthermore, the ghosts can no longer collect treasures. This makes playing as the ghost far less interesting, and many times, he has very little to do. I think the designer is missing the full potential of this part of the game. I tried house rules of allowing ghosts to use treasures (except the potions) and rewarding the ghost 1 bonus attack if he folds fast enough to take a turn order token (any swords on his cloth and in his treasures can also be used to attack). I also allow the ghost player to take a turn in the round that he is killed off, putting more pressure on the living. After all, experienced players will take care not to kill an opponent too early in the game, but rather weaken all players evenly before finishing someone off (another nice feature that keeps players from ganging up on the weakened player). With these tweaks, the game is much more engaging for the ghost players, and the pressure builds quickly once the first player is killed and becomes a ghost. In summary, there are lots of good ideas here, all wrapped up in an original, fun little family-friendly package. James Nathan (1 play): I have and enjoy Fold-It, but it isn’t without its speed-game-issues. (We use it more as an activity and less of a game.) Battlefold is closer to a game for me, but falls a little short. 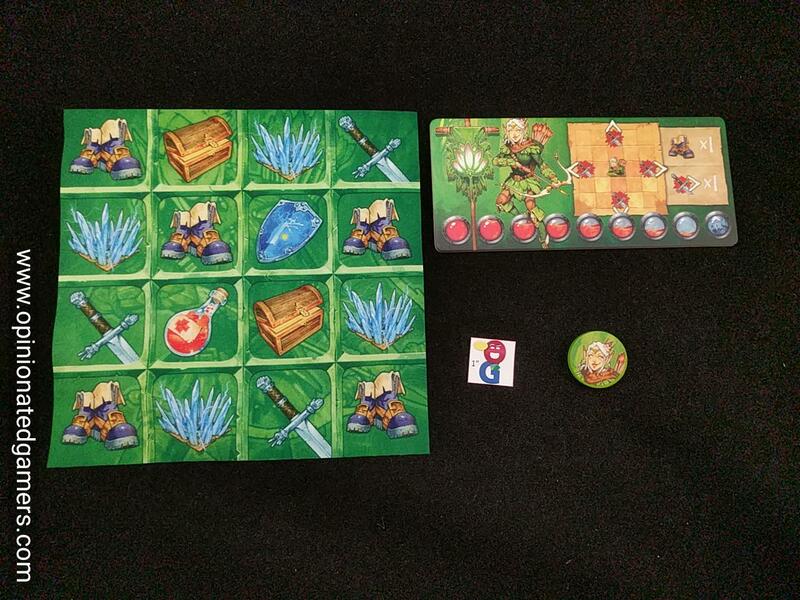 Whereas Fold-It has 16 unique icons on the squares, and each player has the same board, Battlefold has only a few different pictures, players have unique boards, and sometimes the goal card has wild symbols (?’s), where you can include any icon. For me, these changes mutate the folding phase into an even purer speed game, and take out the puzzle of how to actually get the right icons to show after your folds. Fold-It has some more difficult puzzles that we end up trying to solve as a group – and it is those challenges that I enjoy it for, but are absent here. I got a promo with mine! Fold-It is available from ThinkFun in the US.